Before dawn tomorrow – on Thursday, February 24 – the moon will be near the upper part of the constellation Scorpius. 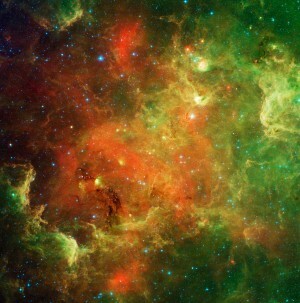 These three stars are sometimes called the Crown of the Scorpion. Scorpius – which now rises in the south-southeastern sky an hour or two after midnight – is the constellation of the Scorpion. Individually, the Crown stars are Graffias, Dschubba, and Pi Scorpii. 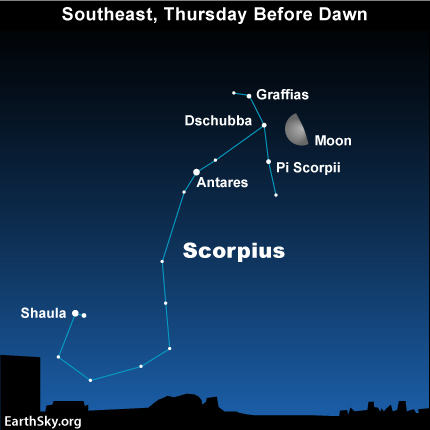 Look for the Crown of the Scorpion to the east (or left) of the slightly gibbous moon in the predawn hours on Thursday, February 24. Site contents copyright © 2019 Recorder Online	except as noted. All rights reserved. | 88 queries in 2.379 seconds.